A new book and an interview with an amazing teacher. Live your dreams now. 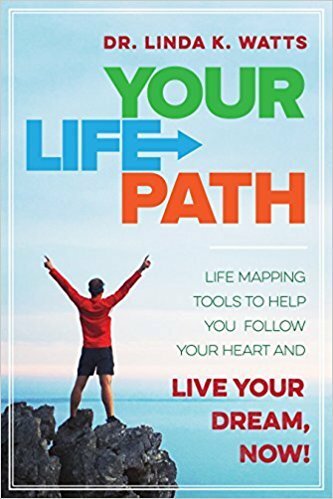 We’d like you to meet Linda K Watts, Ph.D. On March 6, 2018, Skyhorse published her new book Your Life Path—Life Mapping to Live Your Dream, Now!. Dr. Watts’ book was developed from her Life Path Mapping process that provides a way to help readers in their own journey of self-discovery to manifest their goals and better integrate their internalized archetypes or ‘parts of Self’ that influence their lives. Linda has developed and taught her unique Life Path Mapping process that has led to her book, Your Life Path, as a professor of Cultural Anthropology and Linguistics at the University of Colorado-Colorado Springs. She also writes around some related themes in her fun and insightful blog, Better Endings for Your Life Path (http://betterendingsnow.com). What’s really exciting is that Linda is going to be writing some entries for Thrive Global that will reflect and expand on her life mapping insights, as well as fit within the overall goals of Thrive: how to work smarter, with less burnout, and with a healthier attitude towards work and wellbeing. We caught up with Linda during her sabbatical from UC-Colorado Springs in Chautauqua NY and asked her about her upcoming book and webinar series, and what inspires her. Your Life Path—Life Mapping to Live Your Dream, Now! is a book designed to help anyone not only to realize their true potential in life, but how to achieve goals, overcome fears, and identify with different parts of the self harmoniously. Your Life Path has three main sections. The first level is where you step out from your life to look at where you’ve been up to this point. The second phase is reflection, where you reflect on your experiences early in life to understand which ones have helped you or hindered you, which themes come and go through your life like work, romance, etc., and which were helpful and which have held you back. The last part of the book focuses on envisioning and this explains to the reader, ‘Here is where you’re at. This is how you got here. This is what is helping you and hindering you. Here is your archetypal cast of character, the parts of yourself that relate to the different situations that have dominated your life.’ Now you can take this whole cast or parts of yourself with you forward to start looking at what is your life purpose, your life mission, and your life dream, and this part of the book is about arriving at your life dream from the point of view of ‘What do you project as your life dream?’. This is then all about fleshing out alternate possible futures that would help you realize your values, and serve the values and goals of your individual parts of self. 2. What if any literary pilgrimages have you gone on? Well, as an actual literary pilgrimage, Ireland. When I was a senior in high school, I read and memorized nearly the entire Selected Works of William Butler Yeats. I also devoured his less well known book, A Vision, which is a theosophical masterpiece about reincarnation and working with inner guides. So when I went to Ireland, it was important for me to go to western County Mayo and the village of Sligo, to visit Yeats’s grave in a church graveyard under the Benbulben mesa he often wrote about. He’s been a major influence on my life all the way through. 3. What is the first book that made you cry? I wrote my Master’s thesis in semiotics, the study of signs and symbols. I researched readers’ responses to James Joyce’s “Eveline,” which is the opening story in The Dubliners. I was fascinated by that story and that did make me cry, so I did this experiment with several different people reading the same story, and asked them to pay attention to what message they got out of it; based on their backgrounds they would see the structure of the story differently and came away with a different message. “Eveline” is a story about an Irish woman from the early 20th century who is bound by family and nationality and church. Her mother had died so she took care of her father as basically the housewife for her father and brothers. She meets this man from Buenos Aires named Frank, and he’s offering to take her away from Ireland, but as the story goes on, you realize there’s just no way she’s getting out of there. She’s stuck. She can’t leave her father or her family or her church or Ireland, so the story ends where she’s “paralyzed” like a frightened animal as she watches Frank get on the boat and leave. In my next book, Better Endings I have rewritten the ending of “Eveline” so that this time she takes her life into her own hands and leaves. That’s something I help people realize with life path mapping: that you can get caught, trapped in a bubble that contains you, and you can end up repeating your routines and so bound by your life that even though you may have once had goals and dreams, you make very little progress as long as you stay bound. That’s why life mapping can be helpful; it lets you envision a more fulfilling future and then move yourself into manifesting that. It energizes the heck out of me! When I’m ever sad or depressed, I usually realize that I haven’t been writing. So as soon as I go back to writing something I really care about or want to develop, even a blog post, it lifts me out of whatever my physical issues were and puts me back in touch with Source. If I’m not in contact with Source within myself I feel I’m living in an alternate reality. The true reality emanates from where I go to write or to contemplate. Writing for academic journals sometimes leaves me exhausted or drained because I have to focus so much on getting bare information out, but writing the personal development material and blogging or writing fiction energizes me very much. 5. Have you ever gotten reader’s block? That’s a good question because we usually talk about writer’s block. Actually the last 25 years of my life has included some degree of reader’s block, because as a professor I have to do so much academic reading, that it is sometimes hard for me to focus on a book of fiction. When I retire in a year and a half, one of my goals is to get a 100-book list and zoom back in on fiction and poetry. It’s interesting that when William Butler Yeats was writing his book A Vision that was based initially on his wife’s automatic writing episodes, these inner ‘daemons’ told him he had to stop reading altogether in order to listen to the internal guidance that was coming through. Only then could he arrive at his own models or frames of reference for his poetry and for his theosophical beliefs. I always aim to listen to that inner guidance while writing. 6. Do you think someone could be a writer if they don’t feel emotions strongly? I think it would depend upon what they were writing. Technical writers or freelance writers on contract are usually writing copy for a company, and therefore they may not need to feel deeply about what they are writing. For myself, if I don’t feel that passion for what I’m writing in the moment then I might as well stop. I try to write from the heart, not just mind. Integrating emotions is very important for writing, especially for me. Actually Your Life Path is the first of what is going to be a series. I actually have at least 10 books in mind. Four of them are a science fiction series I’m working on, but the next book which will follow this and that I have mostly completed already will be called Better Endings. This book, based on what I call a principle of “better endings,” starts by revising some endings of some popular stories and historical events that I might have always wished would end differently. Then I invite the reader to evise some stories themselves to ‘better’ (not necessarily happier) endings. I then show how we can also use this principle to creatively imagine and bring about ‘better endings’ for a wide range of situations in our own lives. The third book in the series will be The Best of Better Endings and this will contain some of the more popular or interesting “better endings” readers of the previous book have rewritten and shared with me. Another book will deal mostly with people’s own storytelling about their significant shaping events or Turning Points, helping them polish the gems or get to the pearls of their own life experiences, which may help the reader (and others with whom they share their stories) find greater meaning in their lives. 8. What authors did you dislike at first but grew into? JK Rowling. I avoided reading the Harry Potter series for years. Everyone was talking about how it was making the bestseller list and I was thinking, ‘Oh come on, this is a children’s story, Why would I be interested in reading that?’ But then I couldn’t put it down after I picked it up. I love Rowling’s writing but in the very beginning I thought it took her a while to really establish her fantasy world. But once she found her pace I love how you can read a sentence and at the beginning of the sentence the world is of one sort, then it twists so by the end of that same sentence you’re in a different world. She illustrates the heroic adventure cycle author Joseph Campbell wrote about very nicely. 9. Where can people learn more about you? Dr. Linda K. Watts is associate professor of anthropology at the University of Colorado where she teaches courses in cultural and linguistic anthropology. She has published two academic books, several peer-reviewed academic journal articles and invited book reviews, and several freelance magazine memoir pieces. When You Outsmart the Fears, You Propel Yourself to Become the CREATOR of YOUR Freedom!